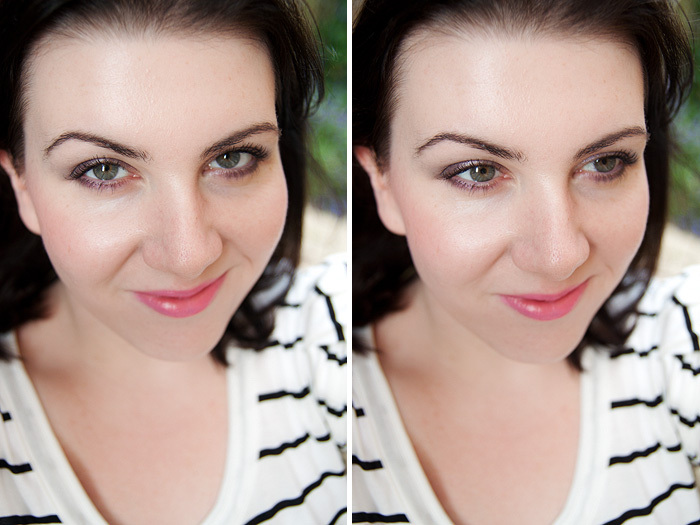 I had a few requests to see how the Giorgio Armani Eyes to Kill Intense #3 Purpura looked when worn, so I applied it as an all-over wash yesterday and snapped some photos. I love it because it’s such an easy-to-wear shade, it applies and blends excellently with just my finger, is dark enough to give some great definition and a hint of smokiness yet light enough to be suitable for Summer. Having said that, longevity (on me) isn’t all that much better than the L’oreal clones I tried a couple of months ago. It doesn’t disappear from my lids completely but after around 4hrs, 70% of it resides in my socket line. Still, it’s beautiful while it lasts… I’ll definitely pair it with a primer next time. Your skin is looking sooo lovely these days! Love the colours! I’ve got No. 1 and it’s so beautiful. I was JUST thinking the same thing too! Amazingly clear skin and it has a nice subtle radiance to it!! Also I love this color. A primer could definitely be the trick to give it a little staying power but perhaps a similar e/s color used to set the cream e/s will definitely guarantee more longevity! 70% fade is quite high!!!! your skin looks AMAZING with the BB Cream! where did you buy it from? That is beautiful on you! Although I can’t help agree with Sara a wee bit. I’ve been trying so hard to resist these, but now I want them! It certainly is pretty but the longevity doesn’t impress. Lovely fresh look you got going there. It’s a very pretty summer color, and I love your fresh and natural look. BTW, you have perfect eyebrows. Strange it didn’t stay long on you, Temptalia gave this 10/10 for longevity. Not sure I want to fork out all that money on it now however pretty it is. Well, the counter in Bentalls has a tester, but none in stock, apparently they never received any?! I did love it though and have been put on the waiting list to be called if and when they have some in stock. You look lovely. Your skin especially! Oh wow that look is STUNNING!! 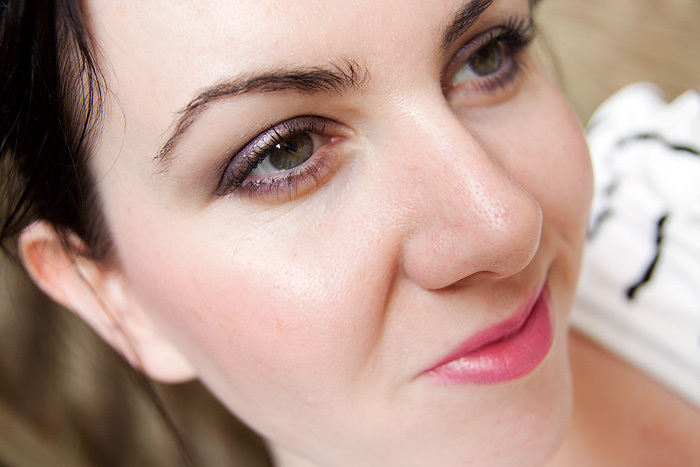 I think Purpura may just have to be my first purchase of the GA ETK shadows! It’s too bad to hear that they don’t wear all that well on their own, but the shade does look just as delicious on your lids as it did on the back of your hand. I have to admit… my logical half thinks I’m being a dork about Purpura, but I’m still tempted! Looks good, and so do you! Your skin is wonderful! That’s a very pretty shade! You look so beautiful and fresh! As gorgeous as this looks, with that kind of performance I’ll stick with my rimmel 8hr mousse. Coincidentally, St. Isidore of Seville mistranslated purpura as ‘purity of light’, much nicer than ‘bruise’ eh?! The colour looks stunning as does your skin:) now you have me lusting after this! Thanks Esha, I’m really pleased I bought it… but now I need to curtail my desires for another one! I bought #9 Champagne this weekend and it wore on my all day (8am – 9pm) and looked just as perfect when I took it off as when I put it on. My lids aren’t particularly oily, though. With a primer, I’d venture to say that it would last for days. That might be a fun experiment! I recommend this color for everyone. It’s an absolutely beautiful neutral light peachy-pink. I’m not cool-toned, but it brightened up my eyes and looked amazing. It would probably “kill” on you, Charlotte! Very jealous that everyone seems to get phenomenal wear on these apart from me! I must be doing something wrong! #9 sounds lovely! have i commented on this already? I didn’t see the eyes. couldn’t help myself from looking at your gorgeous slimmer face contours and this MAC Cremesheen Lipstick in Speed Dial wow!! Four the love of violets!